You can export paper textures into an .xml file which will contain their name and bitmap texture. This can be useful if you wish to back up or share your paper textures. 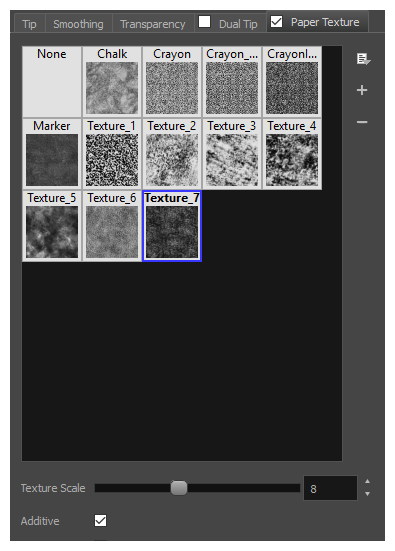 Click on the Paper Texture menu icon and select Export. The Export Tips and Textures dialog opens. This dialog allows you to export both your textured brush tips and your paper textures. By default, both your brush tips and your paper textures are selected for export. 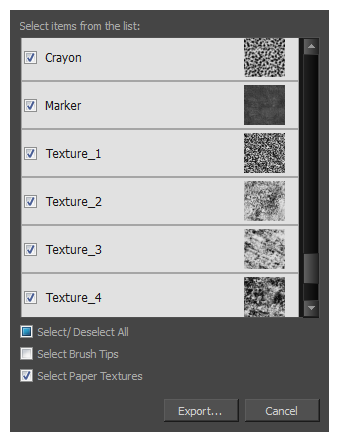 If you only wish to export your paper textures, uncheck the Select Brush Tips option. In the Export Textures dialog that appears, browse to a location where you would like to save the .xml file, then type in the desired file name.